Francis William Higgs was born in 1897 at Bourton in the Vale of White Horse, about six miles north-east of Swindon. 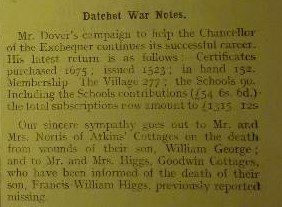 He was known in Datchet as William, perhaps to avoid confusion with his father, Frank Higgs. Frank was a cowman, born in 1870 at East Hannay, near Wantage. In late 1896, he married Mary Ann Woodward who came from Great Coxwell, near Faringdon. Francis William was the eldest of their three children. His sister, Beatrice Annie, was born in Bourton in 1899. (The family was still in the village in 1901; the census recorded them at Swan Hill.) His brother, Henry James, was born in Mortimer, south of Reading in 1907 which suggests the family was living there at the time. By 1911 they had moved to a cottage at Lower Mount Farm, Cookham. This is now the Copas Turkey Farm. The census doesn’t indicate whether 14-year-old William was still at school in 1911 and his subsequent occupation isn’t known. Perhaps he became an agricultural worker like his father? At some point between 1911 and 1915, the family moved to Datchet, to 1 Goodwin Cottages. These cottages used to be on the east side of Slough Road, towards The Myrke. 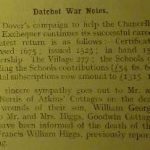 When William enlisted he gave his home address as Datchet, and Marshall’s Local Directory also recorded the Higgs at Goodwin Cottages in the 1916 and 1920 editions. William’s brother, young Henry James, became a choirboy at St Mary’s. William wasn’t the only man from Datchet to join that Battalion. William Johnson, Private 4311, who was killed in July 1916, was also in the 2/1st, as was Albert Edward Carrod, Private 4212, then 266610, who died on the same day as William. The 2/1st Bucks Battalion had been formed in Aylesbury in September 1914 as a second-line unit. In January 1915 it moved to Northampton and was attached to the 184th Brigade of the 61st (2nd South Midland) Division. The 61st was a second-line Territorial Force division raised as a reserve for the first-line battalions of the 48th (South Midland) Division. It moved to Essex in Spring 1915 then to Salisbury Plain in early 1916 before being mobilised for war, landing in France at Le Havre in May 1916. On 18 August 1917, the 2/1st Bucks Battalion arrived at Goldfish Chateau Camp near Ypres. 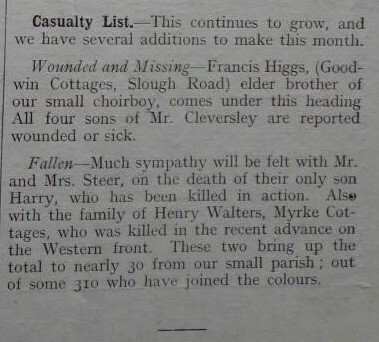 On 20 August, they advanced to the support line near Wieltje but sustained many casualties from shell fire. After dark they went into the line and the following day they prepared for a major attack on the 22nd. The Companies of the 2/1st Bucks Battalion and the Oxfords were to spearhead the advance, attacking in waves. The final objective was a position on the Kansas Cross—Winnipeg Road. At dawn on 22 August, the Artillery put down the barrage and the waves advanced. They were met with strong German resistance. At least some of the Bucks reached their objective but, exposed to fire from all sides, they became cut off. Enemy snipers targeted them throughout the day, firing at runners ferrying information to and from Headquarters, and even shooting stretcher-bearers and wounded soldiers crawling to safety. Many hours later, at 4pm, the Oxfords captured the position at nearby Pond Farm. This relieved some of the pressure on the Bucks. A party was sent forward to take the gun-pits. They found them deserted by the enemy but sheltering many of the wounded men of the Bucks Battalion. The Battalion lost more than half its manpower that day. 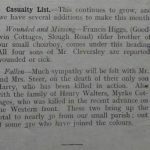 In Citizen Soldiers of Buckinghamshire 1795-1926, Major General J C Swann wrote: “The losses were found to have been very heavy; 13 officers and 637 other ranks went into action, 11 officers and 338 other ranks were reported as casualties.” Both Datchet men, Francis William Higgs and Albert Edward Carrod, were killed that day. An OBLI blog has published an extract from Major General Swann’s book which you can read here. 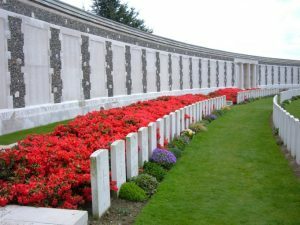 Francis William Higgs is remembered in Flanders at Tyne Cot Memorial, Zonnebeke, West-Vlaanderen, Belgium, on Panels 96 to 98. The memorial bears the names of almost 35,000 officers and men whose graves are not known. For more details about William’s memorial, see the Commonwealth War Graves Commission website. Francis William Higgs was awarded the Victory and British War Medals.